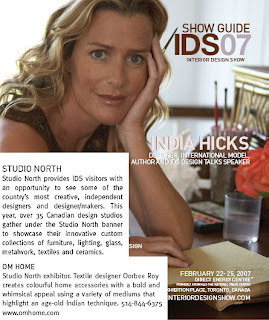 Just got the IDS07 Show Guide and posted it because I'm super excited about the trade show. OM home will be debuting a new line of products at the show so please come visit us, Booth 1, Studio North Section. For more information: Interior Design Show. Stay tuned, we'll post some previews of our new line right before the show. Thanks to Jan over at poppytalk for the awesome posting on her blog. She's got a great sense of design and I feel honored to be amongst some other fabulous designers. Thanks again Jan! Sweetspot.ca listed us nationally yesterday and they said the nicest things about OM home, have a look. As a result, visits to our website have skyrocketed. What a wonderful honor and opportunity for OM home, thanks again! On a side note, today is my parent's 40th wedding anniversary. My parents are wonderful, supportive people, not to mention my best friends. Through thick and thin, they have only gotten stronger. Happy anniversary, thank you for being awesome parents! I love you both very much! I stumbled upon the Etsy shop after seeing products from their site all over the blogwaves. What a great opportunity for emerging designers to post their wares. So, that's just what I did: Have a look. OM home just got listed on the Trunkt.org website, a popular site for independent design. Check it out, here, How exciting! Happy New Year and thank you for visiting our blog! We hope you’ll take some time to check out our website: OM home. We have been very busy at OM home since launching in September, 2006. Our website is finally done and we’re accepting orders from the United States and Canada. Look for us at the Interior Design Show in Toronto from February 22-25, 2007 at the Direct Energy Centre, for more info, Click here. Thank you to all the people who have received us so well over the last few months. We’re thrilled that so many people like our story and our products. I’d like to take this opportunity to thank some people who have really helped move this company forward: Paul Phoa for teaching me how to really understand color, Sumit Roy for ghost-writing, Darren Curtis for the amazing photographs, Alive Pro Studios for helping me with the website development, Sujata Guhathakurta for coordinating the product line in India, Grace Bonney at Design*Sponge for posting an amazing blog entry on OM home and last but certainly not least, Sanjeev Shah for believing in OM home (and me). To show our gratitude to our customers, the first 25 retail orders from our website will receive a 20% discount (to be refunded after check out)!